Astro Decontamination Showers are often the only option where space constraints prohibit use of static or trailed decontamination facilities. 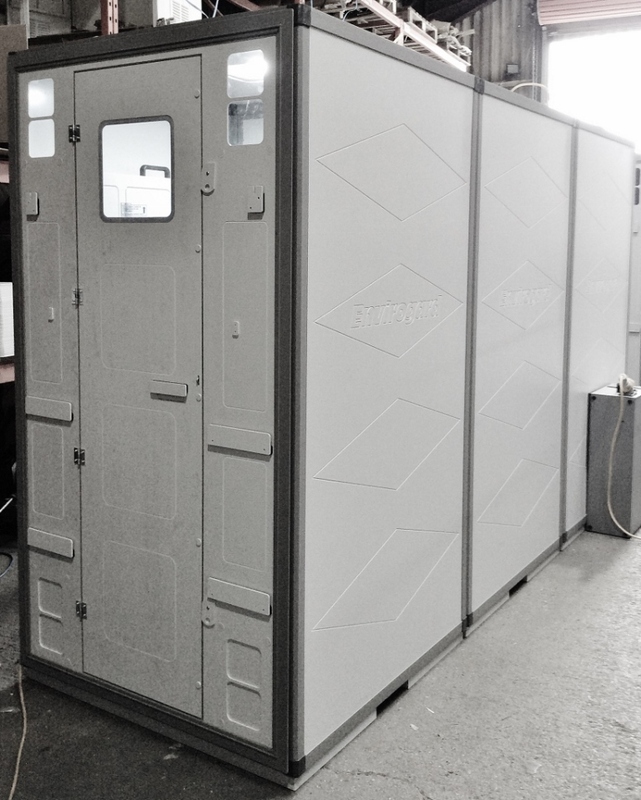 The Astrocab 1200 is quickly and easily erected at site from lightweight panels;this system is intended for indoor use. > plastic panels link to form a 3-stage hygiene unit. > includes bench seating, personal effects lockers, sink, clothes hooks, lighting etc. > air filtration unit clips into the side of the "Dirty" compartment, providing a negative pressure environment and filtering potentially contaminated air prior to discharge. > the green WMS (pictured below) connects to on-site water and power, heats water instantly, and thermostatically regulates it to the temperature the user selects on a simply keypad; this WMS provides unlimited duration showers. 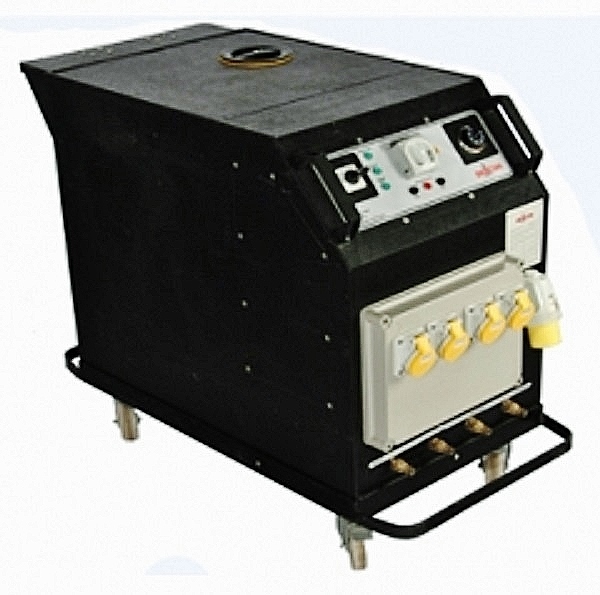 A smart heat-recovery system reduces the initial electrical load from 30 amps down to typically 16 amps soon after start up; supplied with a 32 amp 240v chassis plug and power lead. This is ideal for contracts where the user needs extended shower run times. > the black WMS has a 150 litre reservoir, and heats water gradually over approx 2 hours, operating from a 110 volt power supply. 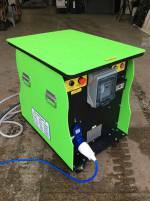 This system is ideal for sites which have limited amounts of electrical power, or which lack a constant supply of water. The shower duration is limited by the size of the reservoir and the re-heat cycle time. 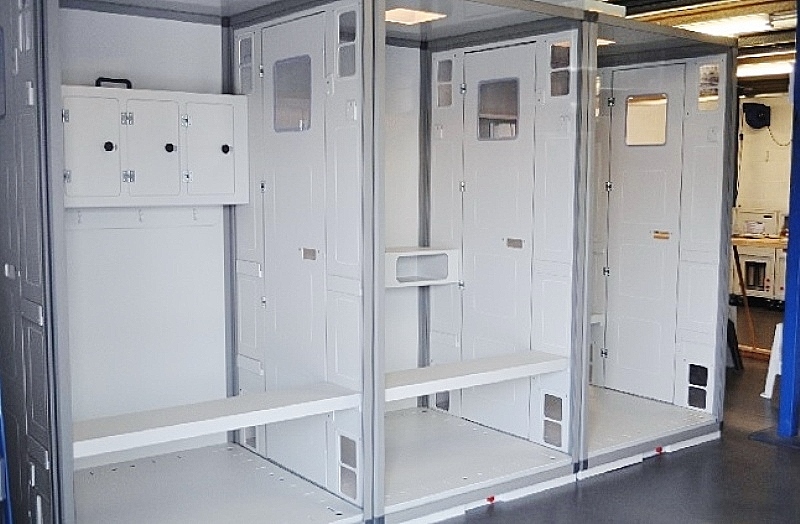 > to comply with HSG247 the modular system may have to be used in conjunction with an air-lock or additional cubicles, dependant on the nature of the contract. The customer is responsible for ensuring that this type of system is acceptable & suitable for their specific application. > this is a large modular system, and as such is best suited for jobs of two weeks plus duration.